I'll totally admit that Having St.Patrick's Day and Easter so close together has kind of thrown me for a loop. I decided to put out a few simple touches for St.Patrick's and love how it turned out. I filled my apothecary jars with faux green apples (I had a coupon for Hobby Lobby and so it ended up being the same cost as buying real Granny Smiths and I'll get to use them year after year), green gum balls (Target party section), Rolos and powdered sugar donuts. ... and I mixed together some of these bowls that I already had on hand. They're such an easy way to add festive color. (See how I used them for Valentines Day HERE). I kept the rest of the counters pretty "standard", I switched out the Sid Dickens tile in the stand to one with a little gold. I knew I wanted to put together a special little dinner setup for the kids and so I threw it together after school on Tuesday. I had stopped in at Target a few days earlier and they didn't have any dark green balloons so I ran with gold and white... which ended up looking a little bridal shower :) hahaha The kids still loved the balloons though - so no harm, no foul. I"m constantly amazed by how much you accomplish and how special you can make everyday feel for your family! Kudos!! I'm also envious of how dang creative you are, Andrea. Love seeing your decor and little crafts and parties like this one. So cool! thank you, girls! I love doing things like this for them and hearing them talk about and remember it throughout the year. So Cute! You are so creative!! I'm with ya about St. Patrick's day and Easter together...it is throwing me for a loop! Right?!?! Way too close :) Thanks, Heather! I joke that I can't even draw stick figures! So cute! Love these ideas! This party is such a great idea! I can't wait to have kids and do little celebrations with each holiday! It makes things so much more special! It's definitely fun to get to experience things with them. Thanks, Sarah! Thank you so much for sharing this with us, I've already printed them out ready for our little celebrations. You are an inspiration. YAY! So happy that you're going to use them :) ENJOY! This is soooo cute!!!! Well done, mama! You're too sweet! I've always been a "doodler" and occasionally it manifests itself into something semi-presentable. Thanks, Lizzie! I don't like when Easter is in March. We have a few things around the house for st Patrick's day and on the 18th I'll take it all down and whip out all things Easter ! What a fun little "lucky" dinner ! And sometimes it's hose simple sandwich dinners that my kids love the best ! Celebrating two weeks early? Your kids looked confused. Some people ?!?! So rude. Seriously Anonymous, of all the encouraging and nice things you could choose to say about this post, this is the only comment you could come up with and actually feel the need to say it?? Never mind Andrea, I see children who are fortunate to a have a mom who never misses an opportunity to make every day and every celebration special for them. Well mannered people understand this and would never judge or disparage the ways in which other people choose to do that. To me, it's like putting your Christmas tree up beginning of December. Why not enjoy it all month long!?! I honestly don't think those small kids are confused or upset that they are having an awesome party 2 weeks before the actual day of St. Patricks Day. How lucky are they that their Mom did all of this for them? We definitely like to celebrate seasons - my kids know that it's March and know that St.Patrick's Day is in March, so no worries about them being confused. Thanks!!! You are so welcome! Thanks so much for reading! I love your decorations! I have got to get myself some apothecary jars! Thanks for the downloads--I'm so impressed that you drew that lucky note! You need some! They're such an easy way to add festive touches. Thanks for reading, Sharon! All I know, Andrea, is those three sweet kids sure are lucky to have you. The memories you are creating for them are unparalleled. Job well done!! Insert blushing here :) Thanks, Kayla! As always, the apothecary jar reveal is always a highlight of any holiday season. :) I also LOVE that quote about the 'perfect house'. The 'lucky to have you' concept is perfect for some happy mail that I've been meaning to send. Thanks for sharing your ideas! I'm so glad you enjoy my jars :) Have fun sending out your happy mail! You can TOTALLY handle it :) Have a great time on your trip! Each December I put all of the upcoming year's holidays on our new calendar, and one of the first things I look for is Easter! I used to hate having to redecorate my classroom for the Dr. Seuss' birthday, St. Patrick's Day, and Easter month. Now that I'm a stay at home Mama, I have the same exact dilemma lol. I really like this simple St. Patrick's Day look! Thank you for the printable, I will definitely be using it! Also, I've seen so many people with those green and white bowls and I swoon each time. How are they with kiddos/toddlers? The bowls have held up really well for us. The kids use them for cereal in the morning and ice cream at night. They go in the dishwasher daily and look good as new. And I love that if something did happen to one - it's only a $6 piece. Thanks so much for responding! Love!!! Could you provide the link to your tiered stand? It's gorgeous ! We absolutely love St. Patrick's Day around our house, so I always look forward to getting to see how you decorated! Love, love, love the kid table! The notes, the plates, etc. Perfect! And now you just inspired me to start decorating and have a dinner party! Thanks Andrea! Oh no! I had no idea! I'll have to google it and make sure I have it right for next year! Thanks for letting me know! You don't have to publish this, but this was just too crazy for me so I did some leg work for you, and you are fine. So silly. You are such a fun mom! Love those cute little colorful bowls. How do you keep the kids from eating your decorations? LOL! I'm wondering how you learned to do the creative lettering that you use on so many things. I'd love to learn! 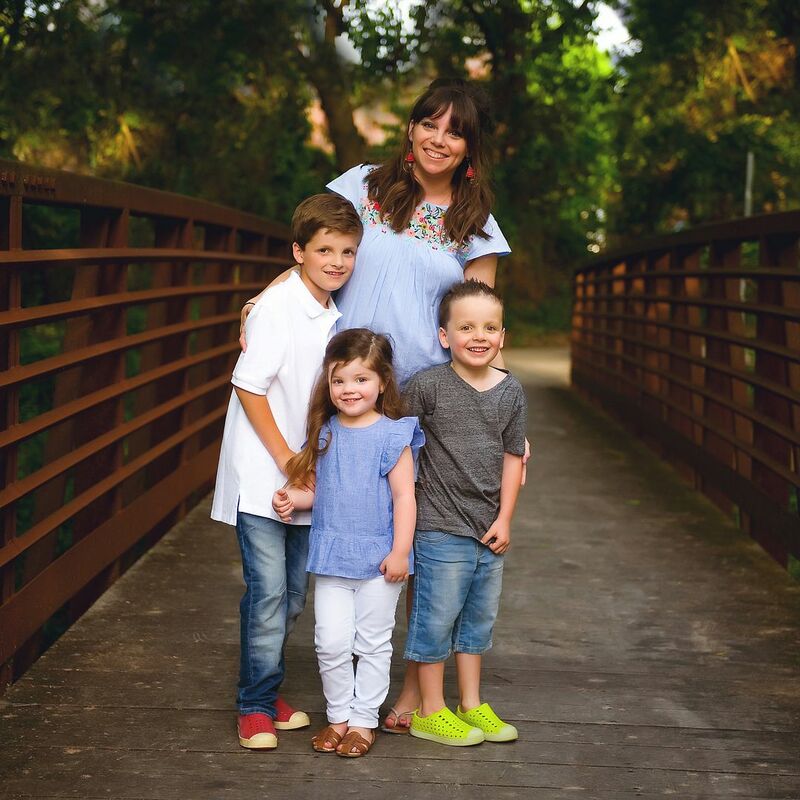 You really are a rock star mom! Working full time and pulling off these special little things you do all the time amazes me. I always love peeks of your kitchen too. At Christmas I went and bought new apothecary jars because yours inspired me. We had them in the past and they got broken so I'm happy to have the new ones. I have some fake green apples as decoration as well, and you would not believe how many people try to pick them up and eat them! Haha. I guess they were worth the money! So cute! You always have the best ideas! LOVE those apothecary jars AND those colored bowls! I'm sure you've said where they're both from in a past post that I missed, but where can I get them?? Thanks in advance! Enjoy your precious little ones...they grow up so fast! Mine are in their late 20's and I STILL do Easter baskets for them. Lol. I love the little table you have for the kids! The close holidays are overwhelming me this year. I decorated for St. Patrick's Day, but swapping decorations the night of the 17th! Days like today make me want to have my holiday celebrations at your house. Such fun ideas. SO cute! I LOVE all your different holiday decorations! I'm sure you've answered this before and I missed it, but, where did you get your apothecary jars AND your colored bowls?? Enjoy your precious "littles"...mine are in their late 20's and I STILL do Easter baskets for them. Lol. 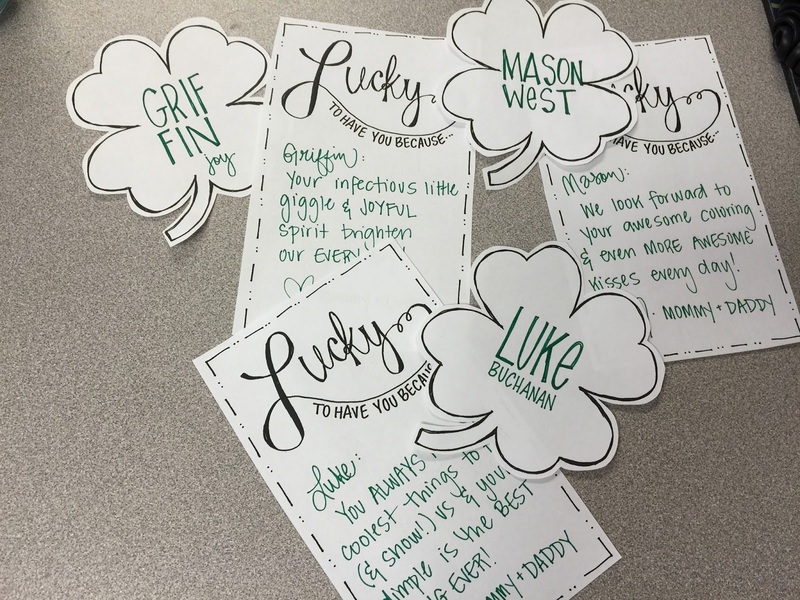 Love your green Lucky party, such a great idea!